A Scottish Officers’ basket hilted sword of “Pinch of Snuff” type dating to the middle of the 18th century. The attractive and delicate construction of the basket guard identifies this sword as a member of an uncommon and distinctive group of mid 18th century Scottish military officers’ swords. The complex hilt design consists of oval shaped apertures mounted between the structural guard bars which are infilled with an elaborate lattice of finely wrought iron-work of unusual lace-like delicacy. The earliest dated sword of this type that we know of, is a London-made silver hilted example with makers marks, probably “TB”, which sold through Thomas Del Mar Auctions in London in December 2014, with hallmarks for 1745 (lot 330). This example would indicate that the sword type arrived in the second quarter of the 18th century and thrived until circa 1780. Clearly the style was popular with the Scottish officer class at a time when Scottish regiments were increasingly being mobilised by the British Army for service abroad, and resembled sword designs developed in Stirling at the time. The “Pinch of Snuff” hilt type was manufactured with two styles of frontal guard loop. One form being a plate fashioned into loops, often pierced with a heart, and secured to the front of the hilt by three screws as in the manner of our sword hilt, and that featured in the Christies Glasgow portrait commented on above. In the second form the loops are integral to the hilt as in a sword illustrated in “Scottish Swords and Dirks”, John Wallace, Arms and Armour Press, 1970, fig 44 and also as illustrated in the Batoni portrait. Some of these swords were manufactured with wrist-guards and some with a horseman’s oval ring. 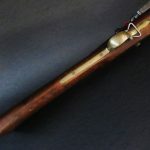 The 18th century back sword blade is of fine quality with a pronounced fuller extending from the hilt underneath the spine to half way down the blade after which it becomes double edged. Beneath this a shallower fuller extends down the middle of the blade from the hilt almost to the tip. The blade has panels of floral engraving near the hilt, now worn. 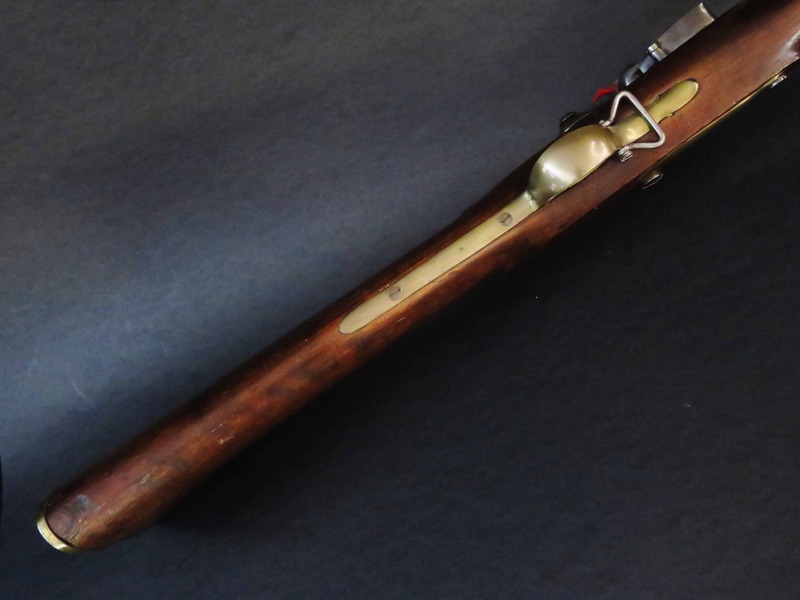 The bun shaped pommel is of typical 18th century British military type, with an integral button and sits comfortably in a ring forged around the top of the basket attached to the guard arm terminals. The spirally grooved wooden grip is covered with shagreen and bound with twisted brass wire with “Turks Heads” top and bottom. The sword is a nice sturdy example. The blade is 33.75 inches long (85.5 cm). Overall the sword is 39.5 inches long (100 cm).